In this video we’ve partnered with Ben Johns to show you how he executes one of his favorite shots…the backhand roll. 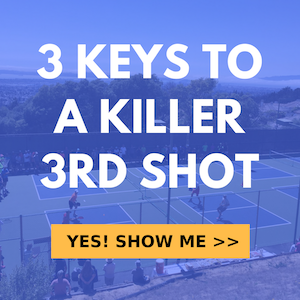 Ben wrote an article on this very topic that was featured in Pickleball Magazine and we thought we’d help bring that article to life with a complimentary video. You’ll find a link to the article in the description. Now, let’s get into the setup, execution motion analysis and slow motion footage of Ben’s awesome Bachand roll. He uses this shot from the kitchen line when all four players are at the net. It’s a surprise shot because the setup of this shot looks very much the same as the setup for his volley dink from the backhand side. Here are two shots of Ben. On one he is about to hit a backhand roll and on the other he is about to hit a backhand dink volley. Consider both images for a moment. Can you tell which is which? So On the left, he is about to hit a backhand volley dink and on the right, he is about to hit a backhand roll. Notice how there are very few differences between these two positions. Certainly not much for an opponent to get a good read on in the middle of a point. What makes it even more deadly is that with a sufficient amount of skill, the backhand roll can be executed on a ball that is contacted below the height of the net. This opens up the possibility of attacking more shots rather than being limited to only those that are above the net. Although it can be executed from either side, Ben primarily likes to use it from the left side when his backhand is his outside shot. He’ll typically aim for the right hip of an opponent that is right handed because that is the most difficult spot to effectively defend. If the opponent is a lefty, he’ll aim for the left hip. Ben will use a backhand slice cross court to set up this shot because that is the shot most likely to lead to a dink reply that might lift a little bit higher. Another good setup option is hitting volley dinks. The time taken away from opponents to react can lead to an attackable shot. Also, as we saw, his volley dink preparation looks very similar to his backhand roll preparation so the roll can come by surprise when the opponent is expecting a backhand volley dink so their is good disguise. Now that we know when to use it and how to set it up. Let’s look at the execution. Once he’s set it up and received the ball he wants, he’ll execute it by getting low (bending from the knees, not the waist), getting the paddle down below his anticipated contact and swing in an upward path at approximately a 40 degree angle. The paddle face will be roughly straight up and down at a 90 degree angle or with a slight downward tilt. The combination of the upward motion and an even or slightly closed paddle face is what produce the topspin. The motion alone is not enough, you will need to generate paddle speed in order to really get power on the shot and make it an effective attacking shot. As Ben outlines in the article, you’ll need to do this by starting your swing with the portion of your arm from elbow to wrist tucked in so that it forms a roughly 90 degree angle with the portion of your arm from elbow to shoulder. As you’re swinging you should extend your arm until it reaches full extension right as you make contact with the ball this motion creates that recognizable snap or flick that makes ball shoot off the paddle. Many think that the motion involves a lot of wrist and it may appear that way when observing the shot in real time but the wrist is actually stable throughout the motion as can be seen here and it’s the combination of arm extension and forearm rotation that supplies the power. Thanks so much for watching and we’d also like to send a big thanks to Ben for jumping on court with us and allowing us to capture this great footage of him and for breaking down his backhand roll and sharing that with everyone. Again if you want to read Ben’s article in Pickleball Magazine there’s a direct link in the video description and if you’d like to get in contact with Ben there’s a link there to do that as well. If you enjoyed this video then please give it a like and also feel free to comment and share and definitely subscribe to our channel for more pickleball instructional videos. We’ll see you in the next one.